Need to move vehicles around a home workshop or commercial garage? Get the task done with ease, care and precision, thanks to our range of hydraulic wheel skates and dollies. Available as a two or four-dolly set, you can lift a vehicle from the wheel without having to touch the frame. With a load capacity of 680kg per hydraulic wheel dolly, these products are a superb addition to any working environment. Expertly-designed and well-built with robust steel frames, you can be sure these hydraulic wheel skates will stand the test of time on even the most demanding jobs. 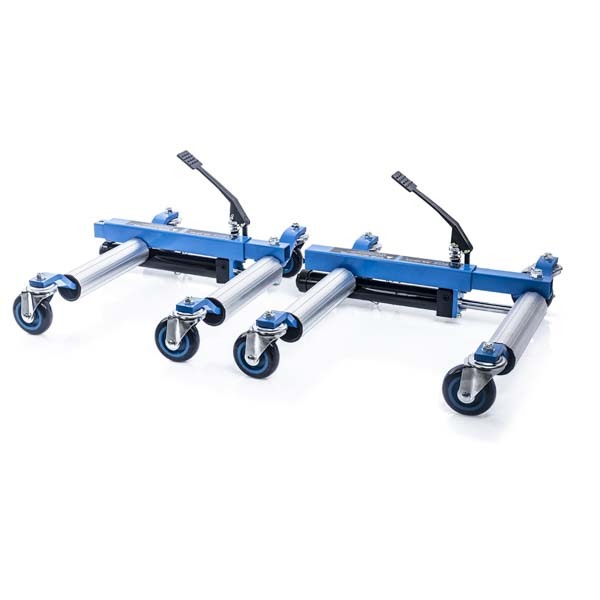 What are the benefits of hydraulic wheel dollies? With our hydraulic wheel dollies, we’re helping to transform the way you work – whether you’re a DIY sports car enthusiast or a professional mechanic. Hydraulic dollies raise vehicles smoothly and safely in seconds thanks to the hydraulic ram and easy foot pedal operation. Use hydraulic wheel skates as a pair and you’ll be able to pivot your car, van or trailer a full 180 degrees. If used as a set of four, you can pivot a vehicle 360 degrees. In a confined space like a workshop or garage, no other equipment can deliver such precise movement of heavy vehicles. SGS can help make day-to-day car maintenance a breeze thanks to our reliable and first-class garage equipment. We’re committed to making your work simpler and safer, starting from the moment you decide to buy from us. Place your order before 4pm on a weekday and you could benefit from our free Next Working Day delivery service. Buy today, use tomorrow. Built to last from heavy duty steel and including durable swivel castors, hydraulic wheel dollies from SGS won’t let you down. For extra peace of mind, we’re happy to supply all products with a free two-year warranty. If you’re not satisfied with your purchase however, no problem. You can get a full refund when you return it within 60 days of delivery – with no quibbles from us! Lifting and working under a vehicle is an essential requirement for any professional or home garage. Without the right lifting equipment, working under a car can be very dangerous. Learn how to safely lift a car using a set of axle stands and a 2 ton trolley jack with our handy how-to guide from the experts here at SGS Engineering. Chocks to Jacks to Creepers - Get more out of your workspace with our extensive selection of high-quality equipment. We explain the best uses for these pieces of equipment. How To Bleed or Air Purge a Trolley Jack - Not sure why your jack isn’t doing the job it’s meant to? Trapped air could be to blame. Watch this video to see how to fix it. How To Buy The Right Trolley Jack - The right trolley jack can make light work of lifting a vehicle, but which is right for you?